Tuesday we were finally back on our way to the Magic Kingdom. 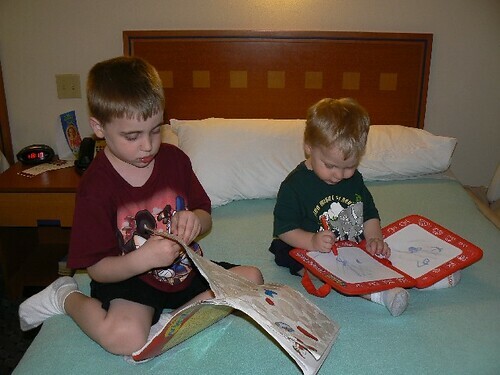 The boys were ready for some fun with Mickey Mouse after spending a day at Hollywood Studios and Animal Kingdom. That morning I called to cancel our reservation for Tonga Toast at the Polynesian resort. 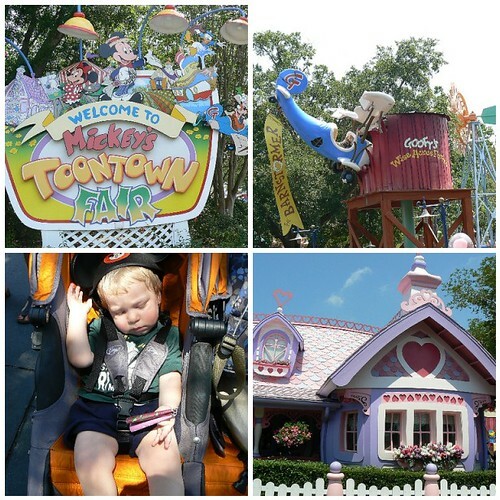 We were not entirely sure when we would be able to get there without a taxi and thought it would be easiest just to get to the Magic Kingdom at our own pace. My parents went off on their own. My mother was told to take it slow today since she was watching an infection that had started on her toe. 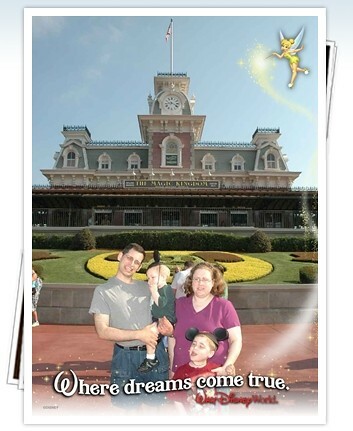 We arrived at the Magic Kingdom just after it opened at 9:00. Before heading in we stopped and had a PhotoPass picture taken. The boys were busy looking at everything else going on since it was quite busy. 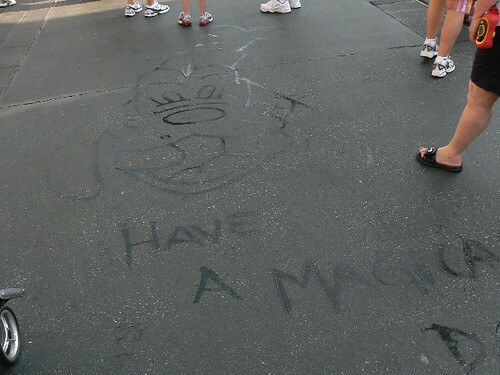 Check out what was on the ground as you walk into the park in the morning. A very easy and clever little touch. After a yummy breakfast, we walked by the castle and over to Tomorrowland. 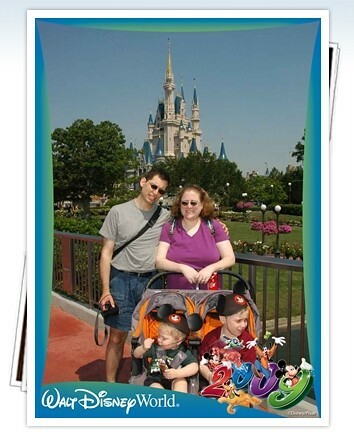 While on the way we saw another photographer and grabbed our PhotoPass card for another picture. The sun was blinding us and thanks to that the boys were looking every other way. After this we kept walking into Tomorrowland. 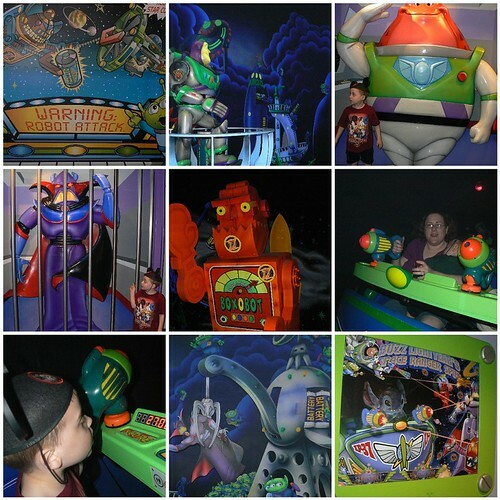 We were shocked that there was NO line for Buzz Lightyear’s Space Ranger Spin. We quickly left the stroller in the parking area and jumped into line. Without any trouble we went back on right away and did it again. Here are some photos from the first ride. This ride was fun, but it is hard to get used to the laser guns that register points. Much more difficult to use than the technology with Toy Story Midway Mania at Hollywood Studios. 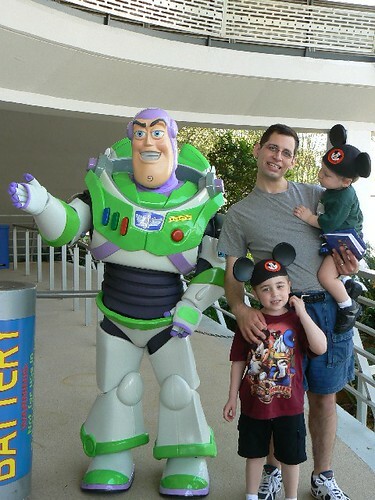 When we were exiting for the second time our eyes noticed that Buzz Lightyear was outside signing stamping autographs and taking photos. This was another great chance for us to ease the boys into the characters. Neither was thrilled with the idea, but they both went and no tears were shed. From here we got right onto Walt Disney’s Caousel of Progress. In hindsight, we probably should have skipped this. Still it was sitting down and had air conditioning. The boys tolerated it and we were lucky. Next we saw that there was going to be a show at the Monsters Inc. Laugh Floor soon. We parked the stroller and hopped onto line for that. This is an interactive show. While on line there are instructions on how to text message jokes in for the show. Then they involve people in the show with parts. 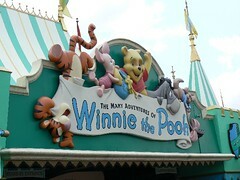 We all loved this attraction since it was hilarious and kept everyone engaged. Here are some photos from things. After this we looked around at a few places and went to Mickey’s Toontown Fair. Whoa baby was it crazy here. There were tons of people packed into a small area. While NHL and JL went to get on line to go on The Barnstormer at Goofy’s Wiseacre Farm someone stopped by to say hello. Of all places to bump into someone from home. A mom from NHL’s school recognized me from PTA meetings and said hello. We found out that we were going to be on the same flight going home. Small world I tell you! 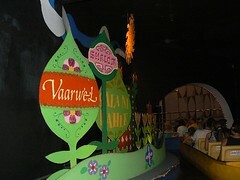 When we were finished with lunch we walked over to It’s a Small World We wanted to do something that JSL would appreciate while he was still awake. The line moved pretty quickly and the boys amused themselves while waiting. 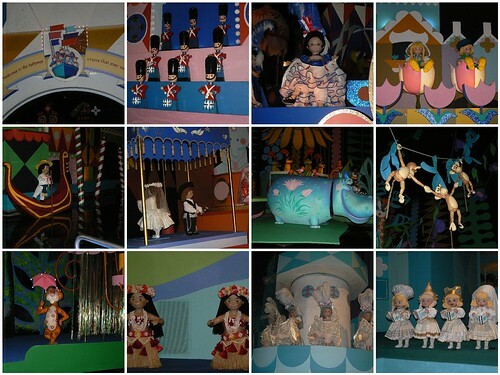 Of course, I still have fond memories from my childhood on It’s A Small World. I always loved the goodbyes in different languages at the end. At this point we decided to move in another direction. We walked over toward The Haunted Mansion. NHL was intrigued by this. JL went off to do a diaper change and while NHL and I waited on line. By the time they came back we were very close to the door of the mansion. JSL was not a happy camper when we walked into the darkness. As soon as we went into the elevator he was spooked and to cope, he went to sleep. NHL thought the ride was neat and did not seem spooked by anything. 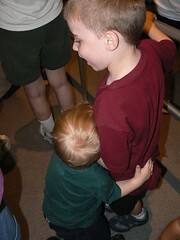 Since JSL was sleeping at this point we decided to walk over toward Splash Mountain and Big Thunder Mountain. Both rides that JSL could not go on. At this point in the day Splash Mountain had over an hour standby wait and the Fast Pass returns were for very late at night. Meanwhile we were shocked to see that there was hardly a wait for Big Thunder Mountain. JL went on with NHL and I received a Child Swap pass to go back on. Sleeping JSL and I went into a store nearby to stay cool. Then I noticed the big parade was about to begin. I had NHL and JL meet me over by the end of the route in Frontier Town. While JSL slept the rest of us watched Celebrations. We figured if the weather was better we could head back to the Park after our dinner. So we managed to get to the Monorail just before it started to downpour. Of course silly us, we got on the Express Monorail. 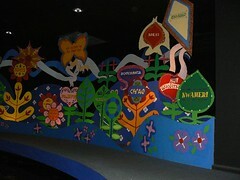 When we arrived at the transportation area we swapped to the ones that went to the resorts. My parents were already at the Contemporary, so we met up with them there. It was early for our reservations, so we shopped around some. Then we went down to where The Wave is located. They were not seating people yet, so we went to wait in the lobby. While there my mother mentioned that her toe was a lot worse. It was now oozing and throbbing. The infection was not going to clear without something stronger. Dad went to the desk at the Contemporary where they gave him the number for a pharmacy in Orlando that will deliver medications to the Disney Resorts for a $5 fee. Sweet! We had a very nice dinner at The Wave. 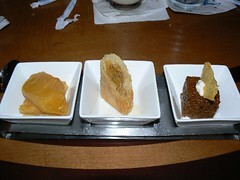 Our meals were very nice, the atmosphere more relaxed and the server was great with the kids. Of course this was also the night that I had my allergic reaction to walnuts that was in my dessert. When we were done with our meal we went back to the hotel since it was still raining. Mom needed to look at her foot and call the doctor, and I had to figure out something to do with my breathing. The boys were still awake and played on the bed while I helped my mother. NHL and JSL were content with the Aqua Doodle Travel and an activity book. Luckily he was able to get a signal and call his sister. He had to get a hold of her to find out when her surgery was scheduled for the next day. When that was done NHL and I went for a walk to meet Nana and Papa. They were trying to schedule the pharmacy delivery at the main desk. After that we went back to the room for showers and the boys went to sleep. We all fell asleep quickly and were anticipating a fun day at EPCOT on Wednesday. Oh wow!!! You guys had a jam-packed fun trip, huh? I love the pictures…they are so great! 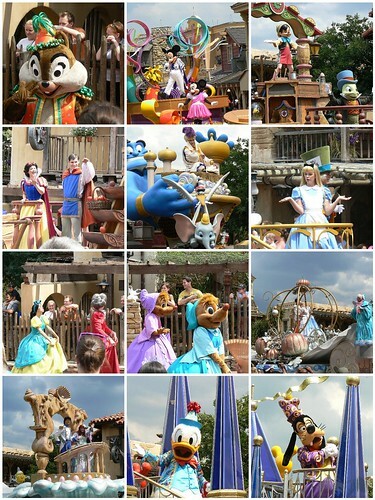 We’re probably the only people who have never been to Disney, so i love looking a tDisney pics! I enjoyed looking at the photos! What a fun day!